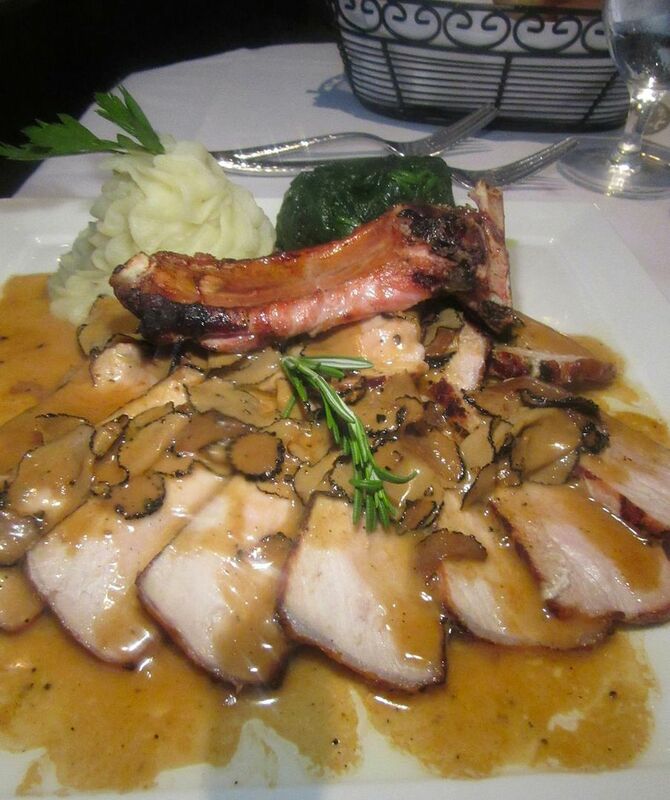 The thick-cut pork chop is served sliced from the bone with truffle sauce and a flutter of sliced truffle. The soul food dinner we’d planned one evening isn’t working out. The air conditioning is defunct. I sit in a breeze from a fan and taste some chicken wings and a lump or two of macaroni and cheese waiting for my friends to arrive so we can decide where to go. This is Manhattan after all, the Theater District, curtains already up everywhere. Should be a cinch. Glassed wine keepers and photographs of masserias in Puglia decorate the walls in the back room. 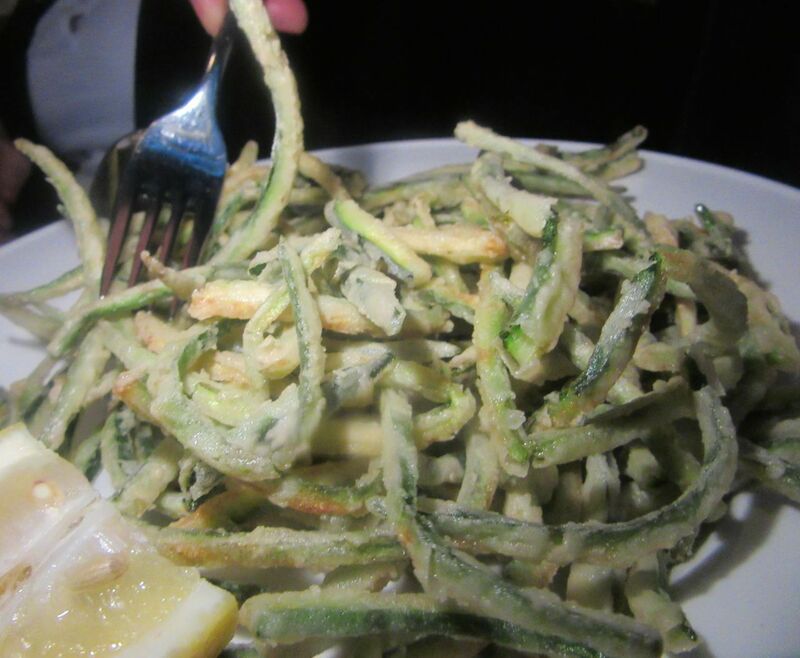 Depending on their mood and who you are, the house might send out crispy fried zucchini strings as a gift. Quickly the white of the tablecloth almost disappears under the offerings. 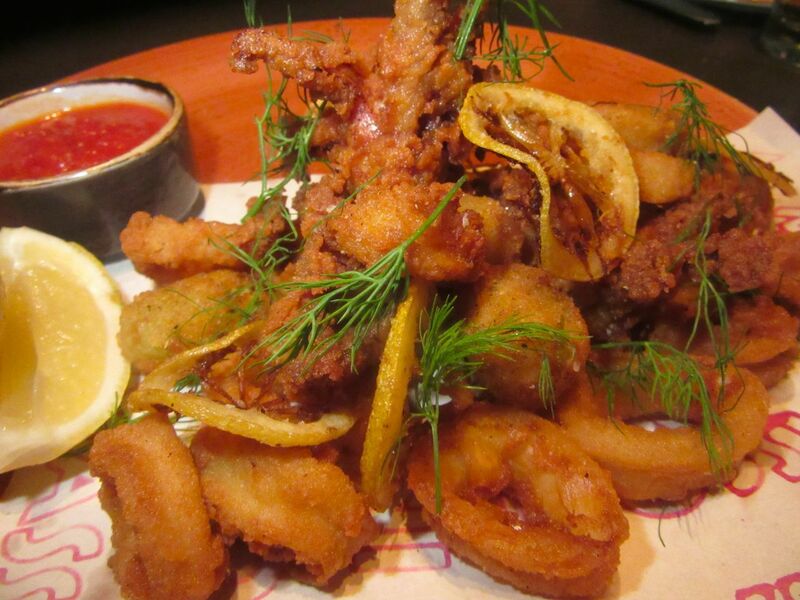 A thatch of deep-fried zucchini strings, with an awkward chunk of lemon to squeeze. Great little zucchini twists. Instantly addictive, just like the house’s excellent cheesy breadsticks that arrive atop warm focaccia in the bread basket. 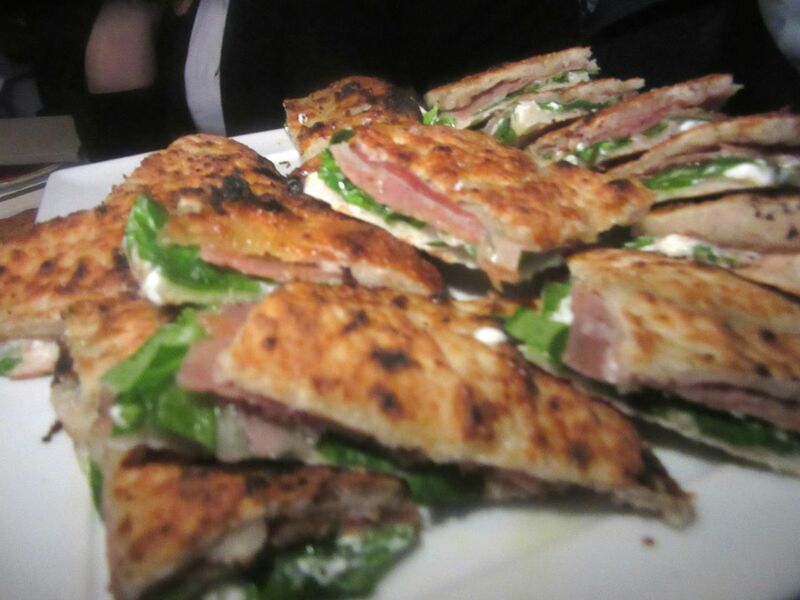 That first night a manager passed by with a platter of delicious little robiola-stuffed focaccia sandwiches. A young man of seeming authority steps up to deliver a few small goodies to our plates: Little focaccia sandwiches stuffed with robiola cheese and prosciutto. “Oh, delicious,” I cry, as he backs away. With that, he decides to park his whole stash on the edge of our table. 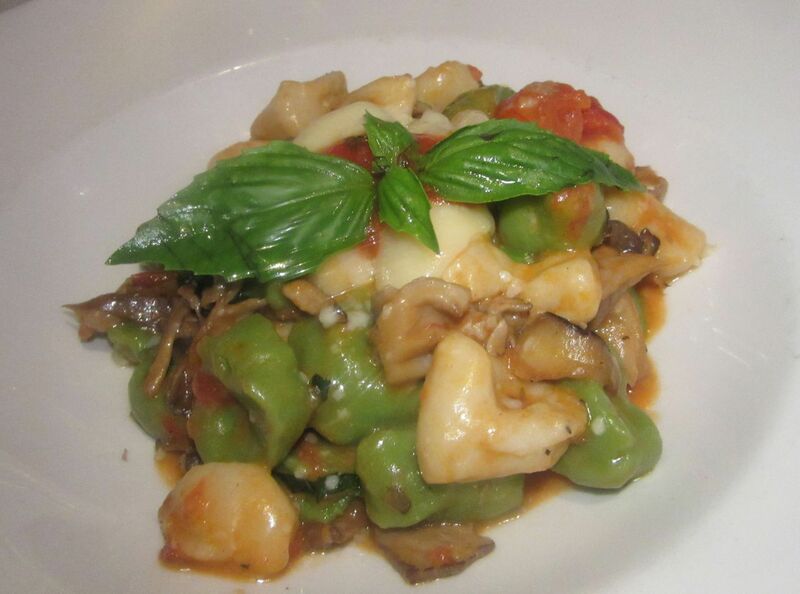 There is always a gnocchi offering and sometimes a gnocchi special both spinach-potato and classic. At that point we are sipping a Manhattan and a couple of glasses of red and it’s getting late. 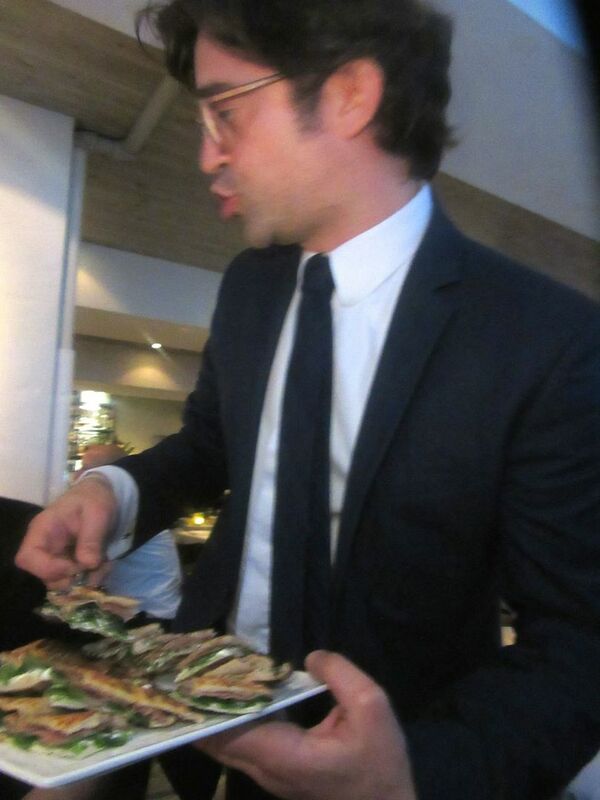 “Should we each just order one dish?” I ask, biting into my sixth robiola canapé. My friend Shelley has already combed the listings and found what she wants. Sausage and little meatballs are tossed into this paccheri pasta with a flavorful tomato sauce. “Me too,” I agree, wishing I’d found it first. But of course she’ll give me a taste. “I hope you like it rare,” I say, ordering the pasta special. I’m impressed by everything that evening. The freebies, of course. 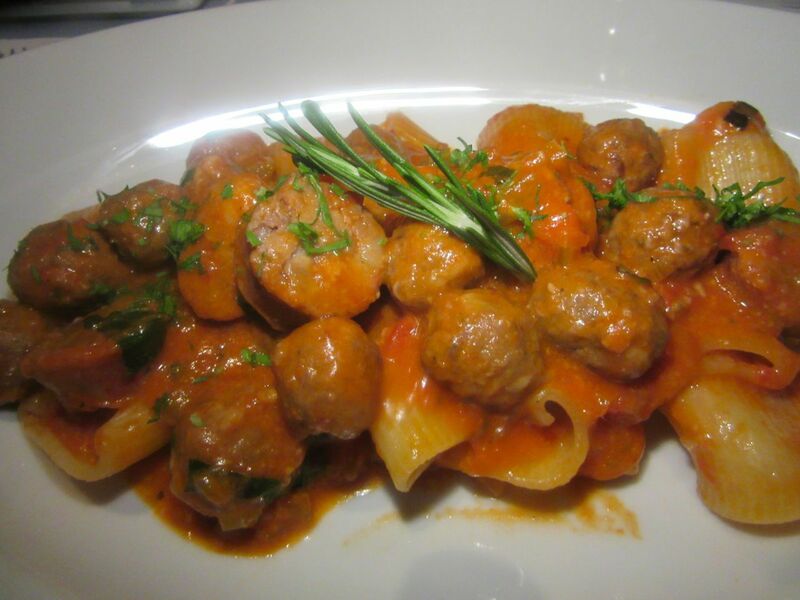 My properly al dente paccheri with tiny meatballs and sausage in a pungent tomato sauce. 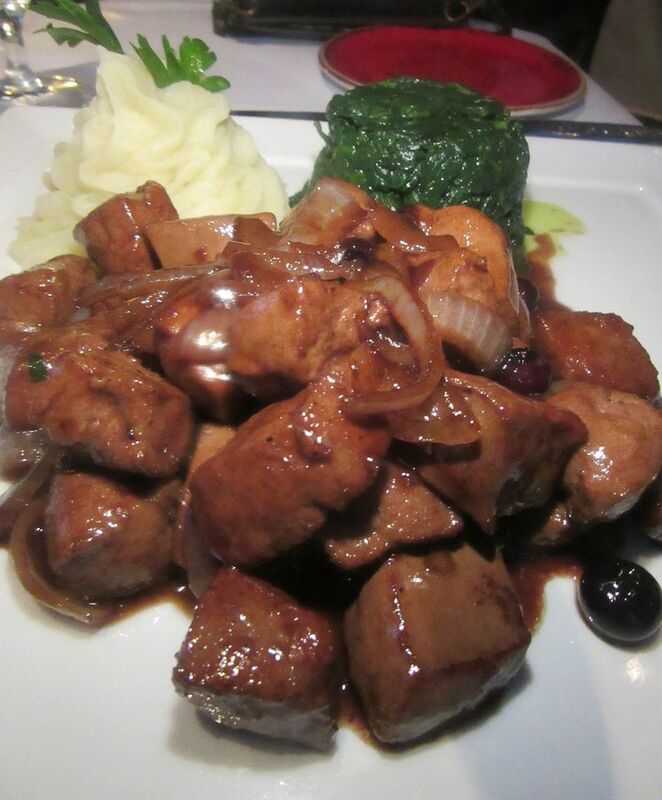 Not many restaurants offer calf’s liver so fans will be happy to know it’s always on the menu at Masseria. The velvety chunks of liver, properly rare, with rings of sautéed onion, get a tart-sweet accent from blueberries in their sauce. A thick-cut pork chop is served almost pink, cut from the bone, slices fanned out under black truffle sauce with a flutter of slices from the actual tuber. A timbale of mashed potatoes and another of fresh, garlicky, sautéed spinach accompany both entrées. 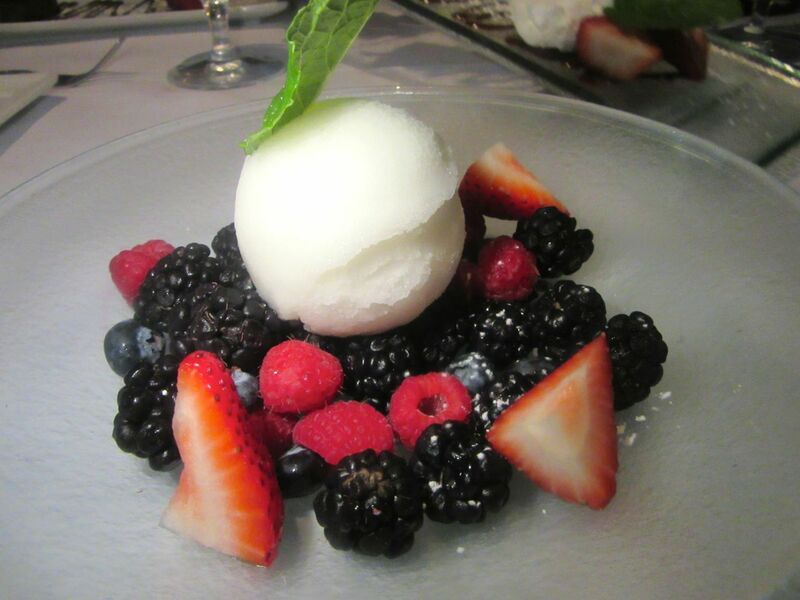 We agree to share fresh berries with lemon sorbetto. The flourless chocolate almond cake and the ricotta cheese torta arrive unexpected, farewell gifts. Sorbetto and berries has to be the perfect dessert after too much – pasta, pizza,whatever. I can’t wait to come back and taste more. Reading the stolen menu at my desk the next morning, I see favorites, classics, and Puglian specials I’ve never had. One of the three owners is from Bari in Puglia as is the manager. The other two are from Capri. That’s why the photographs on the walls don’t look anything like the rustic villas of Tuscany. They capture the white stuccoed architecture of Puglia. 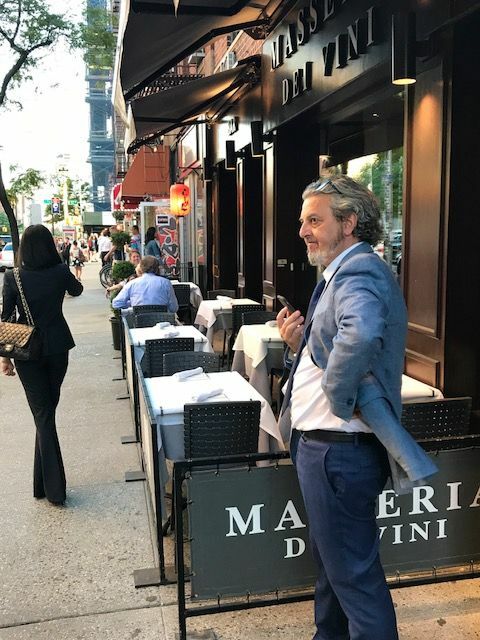 A sister restaurant is La Masseria at 235 West 48th Street. 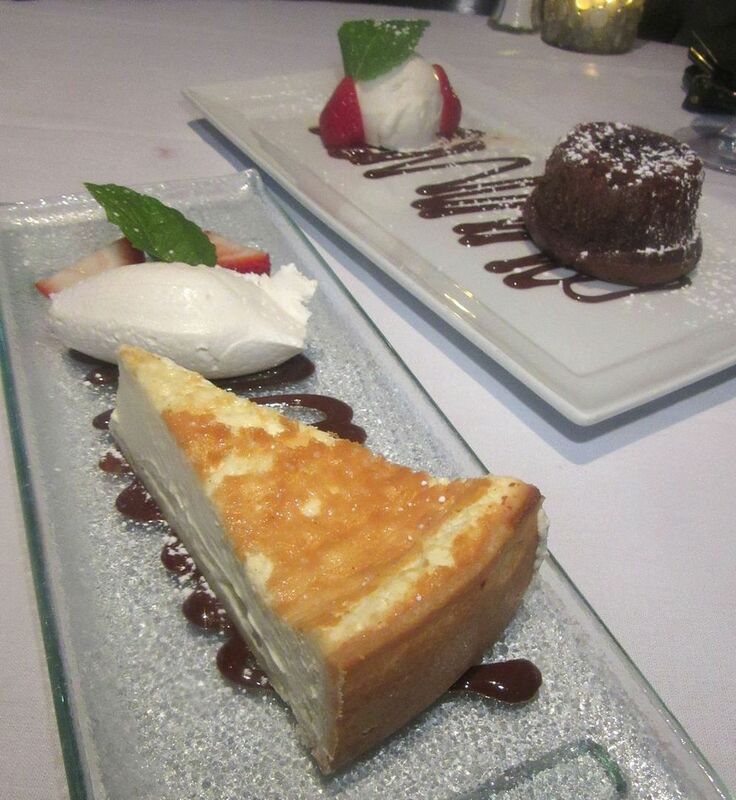 Did we order these desserts --- melting chocolate cake and cheesecake tart – or did they just arrive? I won’t be back with just any of my usual tasters. The place is expensive. 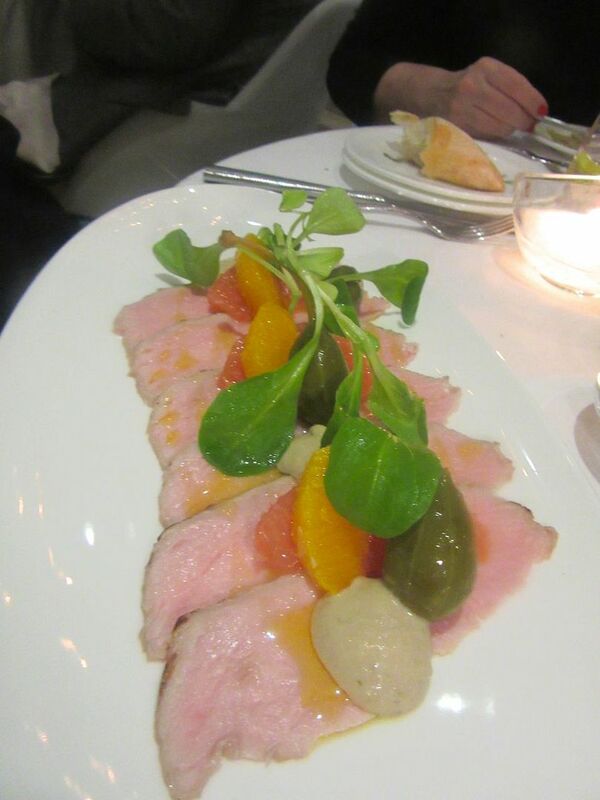 Antipasti, crudo and salads range from $15 for an ordinary toss of greens to $25.50 -- $18.50 for a gorgonzola-pear salad, $23.50 for homemade meatballs, $24.50 for tuna carpaccio, $25.50 for a stracciatella pizza with creamy mozzarella and Parma prosciutto. Pastas are priced as high as $30.50. Entrées up to $46.50. 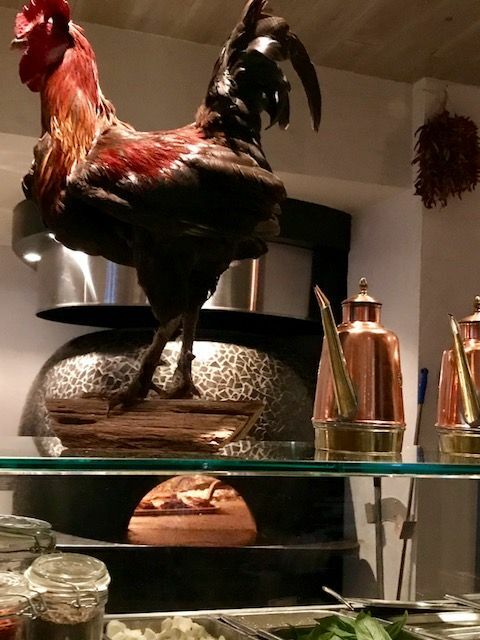 This stuffed rooster lords it over the pizza oven on a shelf with copper pitchers of olive oil in the front room. Some of my dine-out friends don’t seem to notice the right side of the menu. That’s good, I suppose, in this moment of over-aggressive pricing. But others benefit from ordering fewer dishes and sharing. There are no giveaways for our foursome a few weeks later at our table facing the pizza oven. 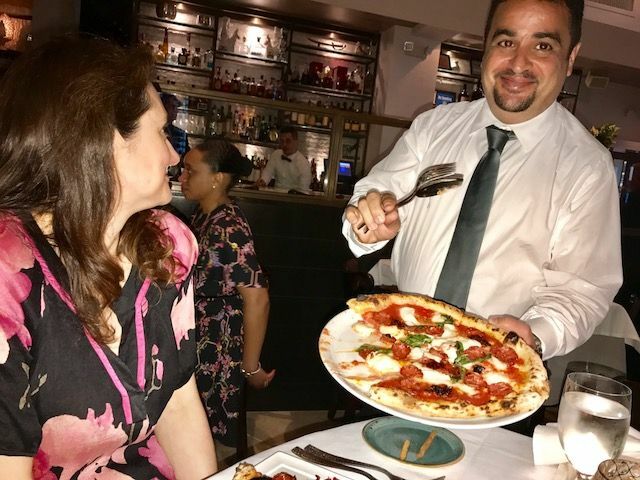 The waiter delivers our Calebrese pizza with sopressata sausage and an extra kick from spicy 'nduja. Sharing the fritto misto and the Calabrese pie with soppressata and spicy mashed ‘nduja sausage is my plot to start. There is a whole roasted pepper atop arugula, radicchio, endive, mushrooms, olives and tomato on the Masseria salad. I’m not sure why my friends aren’t as dedicated to this rich toss as I am. Maybe the dressing could have a better balance of olive oil, a really good olive oil. 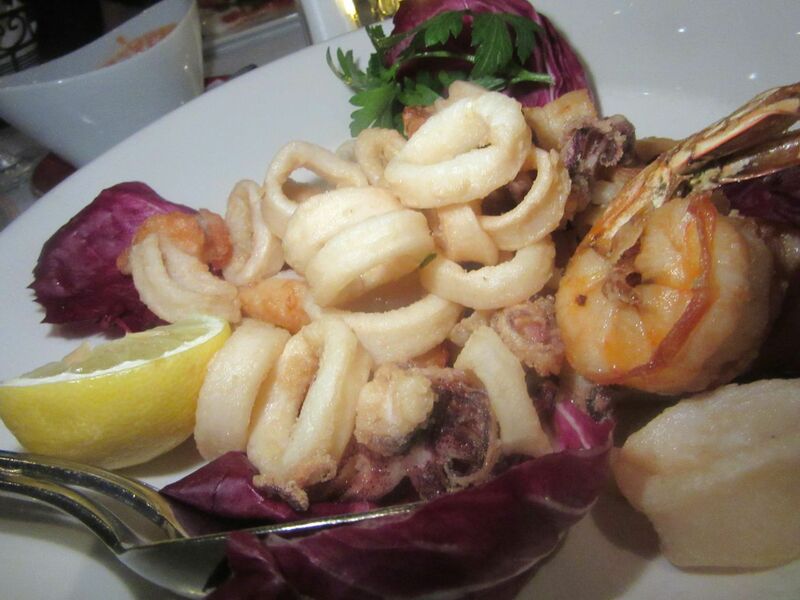 It’s not the greatest seafood fritto I’ve ever eaten but it’s good enough and that’s irresistible. 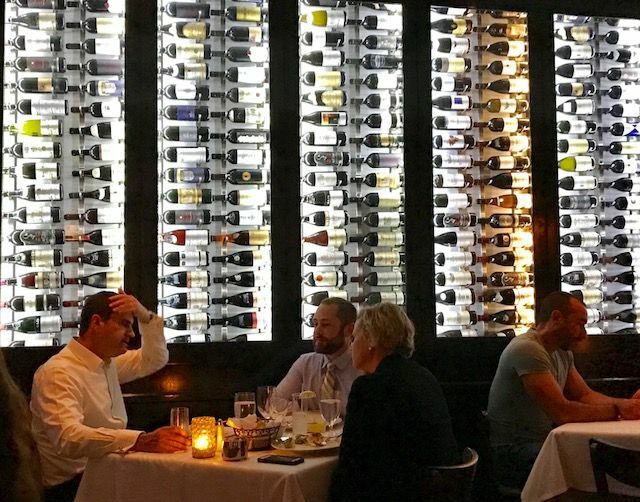 I’m curious to try the duck breast sautéed in Vin Santo, or the Milanese veal chop with the usual salad on top, or the Mediterranean orata in a cherry tomato sauce with olives and capers. 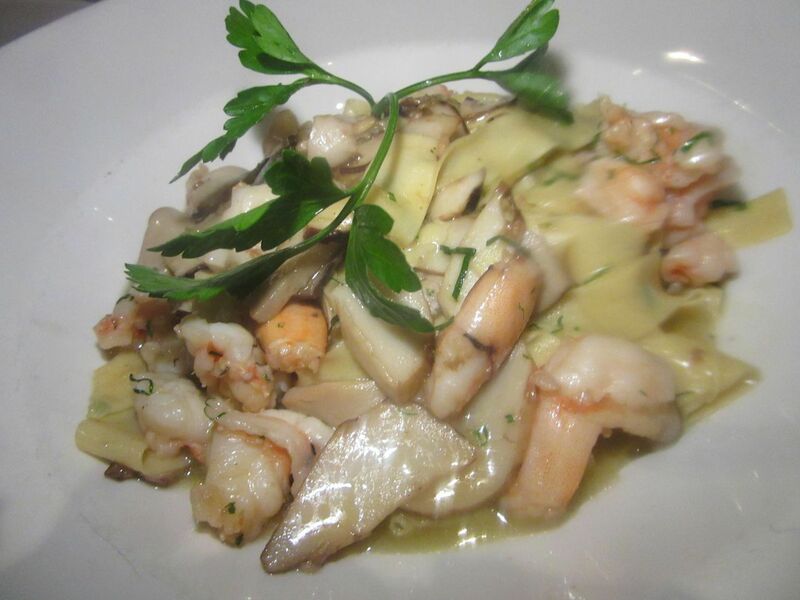 But none of us can even think of another bite after dividing large portions of the shrimp and mushroom-studded pappardelle special and the sprawling ravioli triangles stuffed with shrimp and artichokes in light tomato and shrimp sauce. The pappardelle special of the evening is tossed with shrimp and mushrooms. Did we order the warm apple tart with its too-cooked undistinguished apples? Probably, but neither it, nor the prettily decorated but boring little Torta Masseria topped with a profiterole appears on the bill. Maybe dessert as a gift is a house ritual. My favorite is definitely the ricotta cheese torta. My niece Dana catches the manager out front, grabbing some fresh air early in the evening. My hope of exploring enough of the Masseria dei Vini evaporates on my third visit. The magic fades too. I tell the host I am meeting Mr. Bloch. He seats me in the front room where various waiters approach, one after another, and ask what I’d like to drink. “New York water and a glass of ice, please,” I respond. One by one they disappear. I’m actually getting thirsty. At that point my friend, seated in the back room, comes out to look for me and asks why I am seated in the front room. This trio of amuses is not nearly as amusing as the toasted robiola and proscuittto-stuffed sandwiches. The host looks confused, as indeed he was and after he escorts me to the proper table, out comes the complimentary fried zucchini and a little plate of other offerings: sausage rounds, cheese cubes and squares of pizza bread. 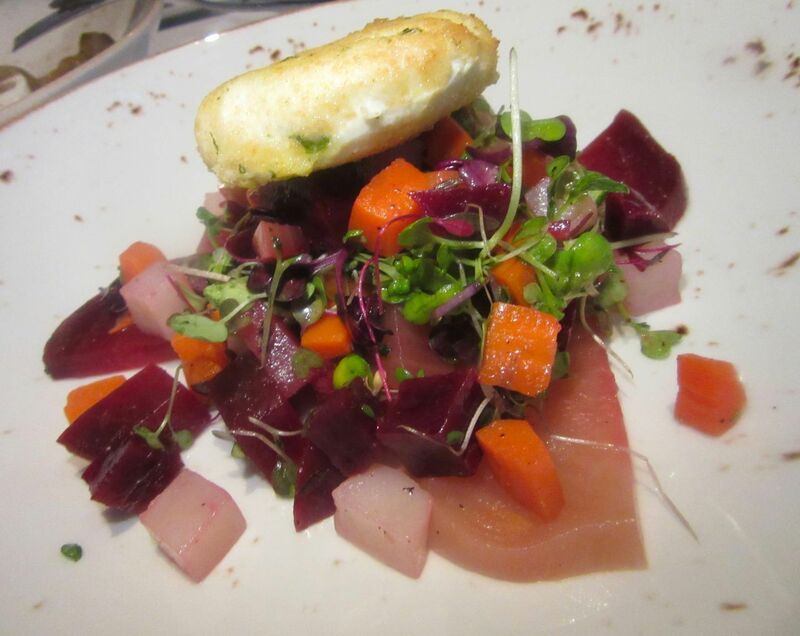 The beet salad with carrot and potato is topped with a warm goat cheese cake, elegant but expensive at $18.50. The beet salad with a warm goat cheese cake on top is fine. 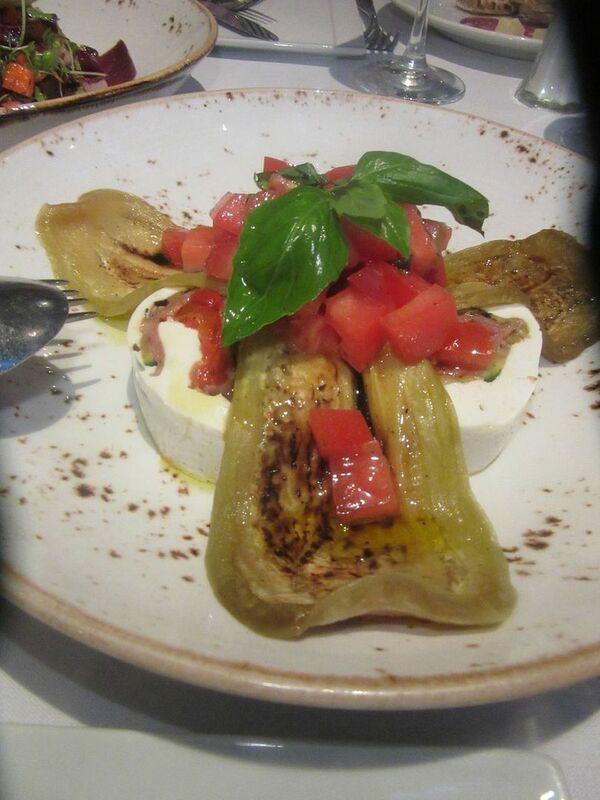 But the stuffed mozzarella dello chef is a disaster. These huge tasteless chunks of cheese topped with sprawling eggplant slices and chopped raw tomatoes cannot possibly be fresh-made mozzarella. Perhaps it’s the chef’s night off. This hideous white stuff with eggplant sprawled on top can’t possibly be stuffed fresh mozzarella. Still, I am happy enough with the gnocchi Sorrentino special: potato-spinach dumplings and mozzarella in cherry tomato sauce. And the orecchiette alla Barese – little ears with broccoli rabe and sausage -- is brilliant. Snarls of sautéed broccoli rabe rather than just plain broccoli makes a big difference. 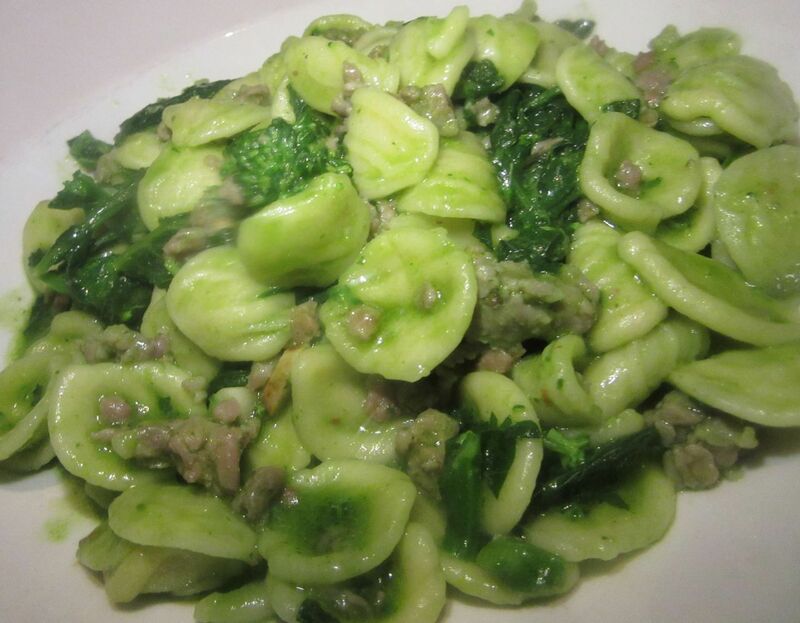 I liked all the pastas I tasted but orecchiette Bari-style with sausage and lots of broccoli rabe is my favorite. 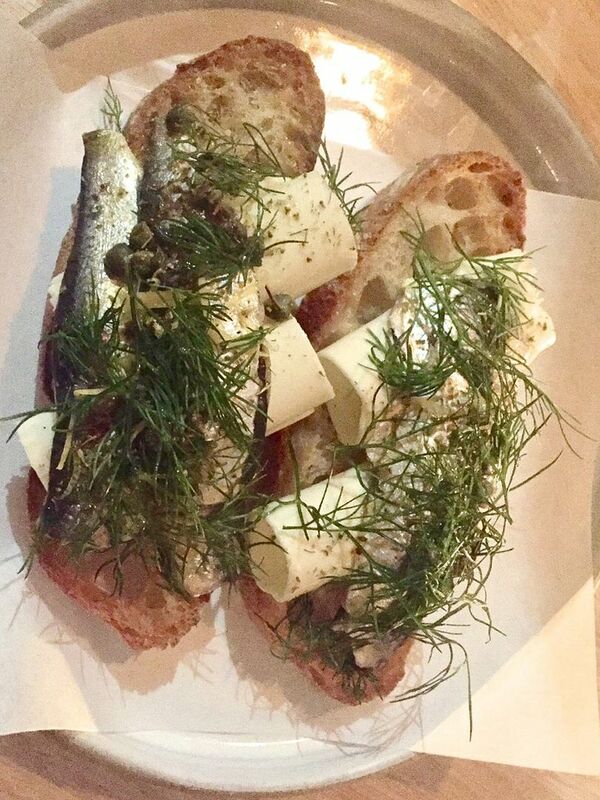 Unlike so many old-fashioned Italian restaurants where the huge, very stiff menu sits in your lap and you can’t flirt with your friend’s husband, Masseria’s narrow, neatly-bound itinerary is a guide to all sorts of dishes I have yet to explore. It sits close to me just south of Columbus Circle. Carlo suggests I just order the focaccia sandwiches with prosciutto di Parma and robiola (not on the menu) rather than wait to see if the house will try to humor me as a service victim or decide to indulge a real or imagined celebrity. 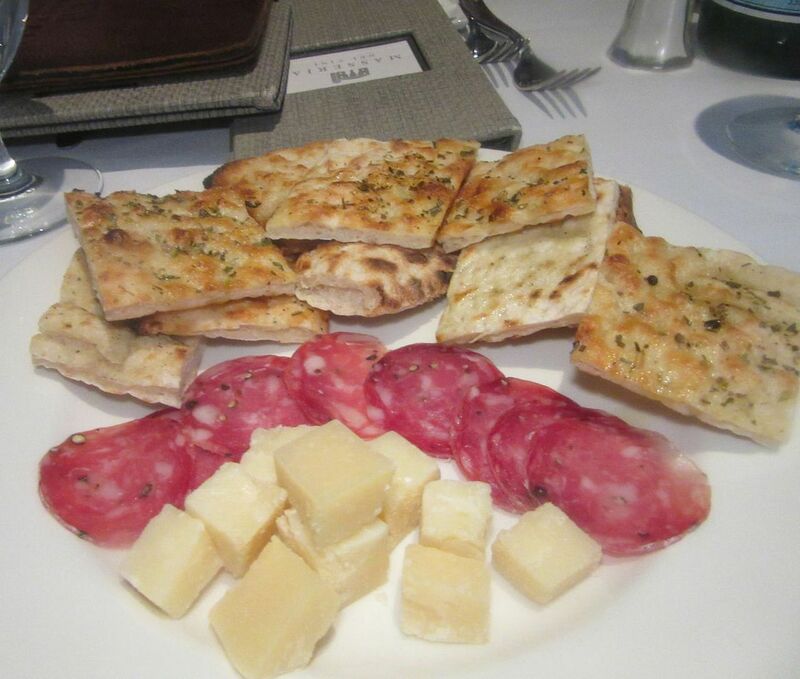 Manager Carlo Scoditti suggests ordering the little prosciutto-and-robiola sandwiches not on the menu. 887 Ninth Avenue between 57 and 58th Streets. 212 315 2888. Monday through Friday lunch 12-3 dinner 5pm to11pm. Saturday 5 pm to midnight. Sunday noon to 10 pm.